If you're going on a cruise or tropical vacation, you're going to need some nice stylish clothing to wear at night for the entertainment on board. A Short sleeve olive Mandarin collar walking suit are the perfect cruise wear to wear on a cruise ship at night. That is because they are both dressy and casual at the same time and look great. 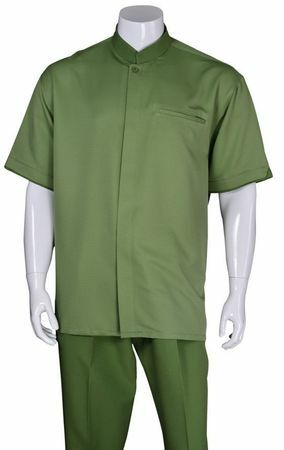 This olive green color short sleeve walking suit features a Chinese Mandarin style collar shirt that has a slash pocket on the chest and matching pleat style pants all made of soft comfortable poly fabric. You'll love the classy way you look wearing this olive Mandarin collar walking suit from Contempo Suits.